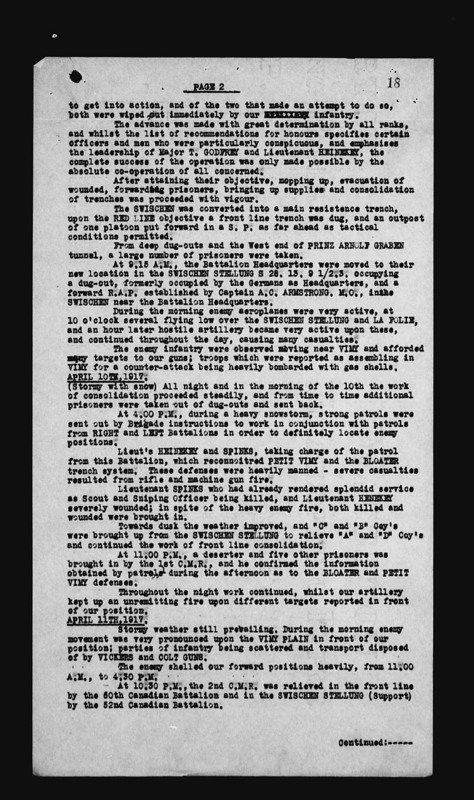 SEE ATTACHED APPENDIX “B” – FULL REPORT ON OPERATIONS AGAINST VIMY RIDGE. 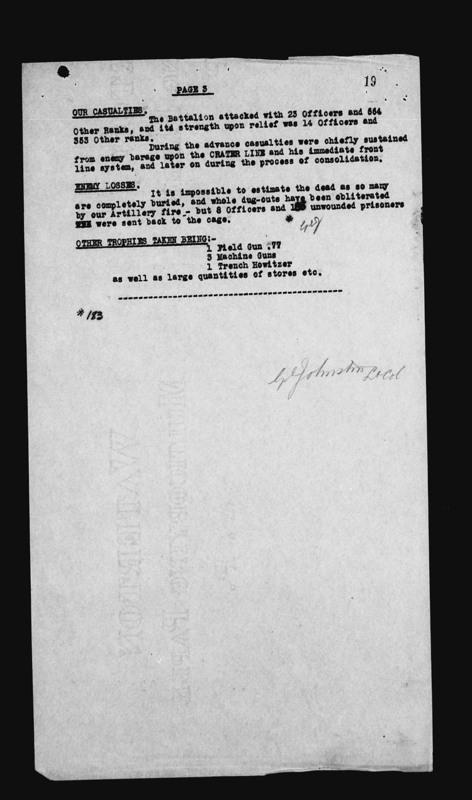 The 2nd C.M.R.Battalion held orders for the attack and capture of VIMY RIDGE, the ZERO HOUR and time being notified as 5.30 A.M. Monday – April 9th, 1917. Prior to that date all arrangements had been completed by the Battalion for its jumping off trenches, supply, communication and other essentials of thorough organization, whilst preparatory raids had given information as to the enemy’s disposition. Operation Order No.44 by Lieut-Col. G.C. JOHNSTON in Command of the 2nd C.M.R.Battalion (copy attached hereto) gave the objectives of the 8th Canadian Infantry Brigade, and detailed the duties of the personnel under his own command. The attack of the 2nd C.M.R.Battalion being subdivided into four phases; 1st – the capture of the enemy’s front line system. 2nd – the capture of his main resistence line, known as the SWISCHEN STELLUNG. 3rd – the capture of the new subsidiary resistence trench, named the FICKLE together with LA FOLIE FARM. 4th – the FINAL OBJECTIVE, the RED LINE laid down in orders from S 29 B 7.0. to S 29 B 2.4. with the immediate establishment of a protective outpost system. To “B” COMPANY under Lieutenant (Act/Major) D. U. CAMERON was allotted the first task, “C” COMPANY – Major T. Godfrey, “D” Company Lieut. J.P.HEINEKEY and “A” COMPANY Captain J.L.GRAY, being detailed to the SWISCHEN STELLUNG, FICKLE and LA FOLIE, and the RED LINE respectively. 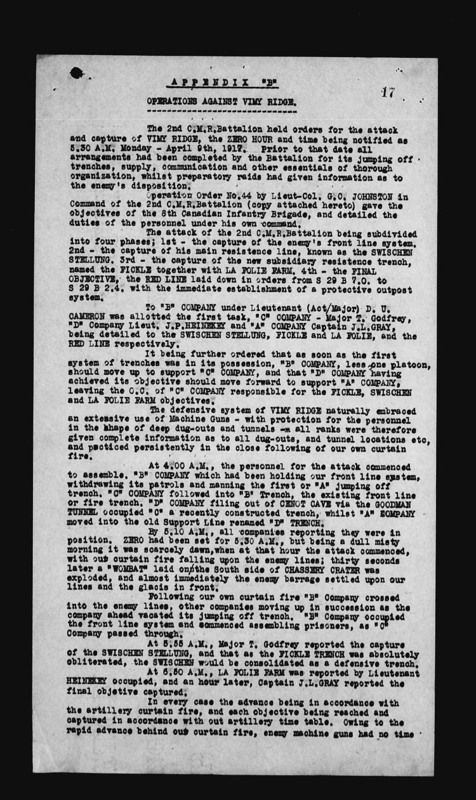 It being further ordered that as soon as the first system of trenches was in its possession, “B” COMPANY, less one platoon, should move up to support “C” COMPANY, and that “D” COMPANY having achieved its objective should move forward to support “A” COMPANY, leaving the O.C. of “C” COMPANY responsible for the FICKLE, SWISCHEN and LA FOLIE FARM objectives. The defensive system of VIMY RIDGE naturally embraced an extensive use of Machine Guns – with protection for the personnel in the shape of deep dug-outs and tunnels – all ranks were therefore given complete information as to all dug-outs, and tunnel locations etc, and practiced persistently in the close following of our own curtain fire. At 4.00 A.M., the personnel for the attack commenced to assemble. “B” COMPANY which had been holding our front line system, withdrawing its patrols and manning the first or “A” jumping off trench. “C” COMPANY followed into “B” Trench, the existing front line or fire trench. “D” COMPANY filing out of CENOT CAVE via the GOODMAN TUNNEL occupied “C” a recently constructed trench, whilst “A” COMPANY moved into the old Support Line renamed “D” TRENCH. By 5.10 A.M. all companies reporting they were in position. ZERO had been set for 5.30 A.M., but being a dull misty morning it was scarcely dawn, when at that hour the attack commenced, with our curtain fire falling upon the enemy lines; thirty seconds later a “WOMBAT” laid on the South side of CHASSERY CRATER was exploded, and almost immediately the enemy barrage settled upon our lines and the glacis in front.Following our own curtain fire “B” Company crossed into the enemy lines, other companies moving up in succession as the company ahead vacated its jumping off trench. “B” Company occupied the front line system and commenced assembling prisoners, as “C” Company passed through. At 5.55 A.M., Major T. Godfrey reported the capture of the SWISCHEN STELLUNG, and that as the FICKLE TRENCH was absolutely obliterated, the SWISCHEN would be consolidated as a defensive trench. At 6.50 A.M., LA FOLIE FARM was reported by Lieutenant HEINEKEY occupied, and an hour later, Captain J.L. GRAY reported the final objective captured. In every case the advance being in accordance with the artillery curtain fire, and each objective being reached and captured in accordance with out artillery time table. Owing to the rapid advance behind our curtain fire, enemy machine guns had no time to get into action, and of the two that made an attempt to do so, both were wiped out immediately by our infantry. The advance was made with great determination by all ranks, and whilst the list of recommendations for honours specifies certain officers and men who were particularly conspicuous, and emphasises the leadership of Major T. GODFREY and Lieutenant HEINEKEY, the complete success of the operation was only made possible by the absolute co-operation of all concerned. After attaining their objective, mopping up, evacuation of wounded, forwarding prisoners, bringing up supplies and consolidation of trenches was proceeded with vigour. The SWISCHEN was converted into a main resistance trench, upon the RED LINE objective a front line trench was dug, and an outpost of one platoon put forward in a S. P. as far ahead as tactical conditions permitted. From deep dug-outs and the West end of PRINZ ARNOLF GRABEN tunnel, a large number of prisoners were taken. At 9.15 A.M., the Battalion Headquarters were moved to their new location in the SWISCHEN STELLUNG S 28. 13. 9 1/2.3. occupying a dug-out, formally occupied by the Germans as Headquarters, and a forward R.A.P. established by Captain A.C. ARMSTRONG. M.O., in the SWISCHEN near the Battalion Headquarters. During the morning enemy aeroplanes were very active, at 10 o’clock several flying low over the SWISCHEN STELLUNG and LA FOLIE and an hour later hostile artillery became very active upon these, and continued throughout the day, causing many casualties. 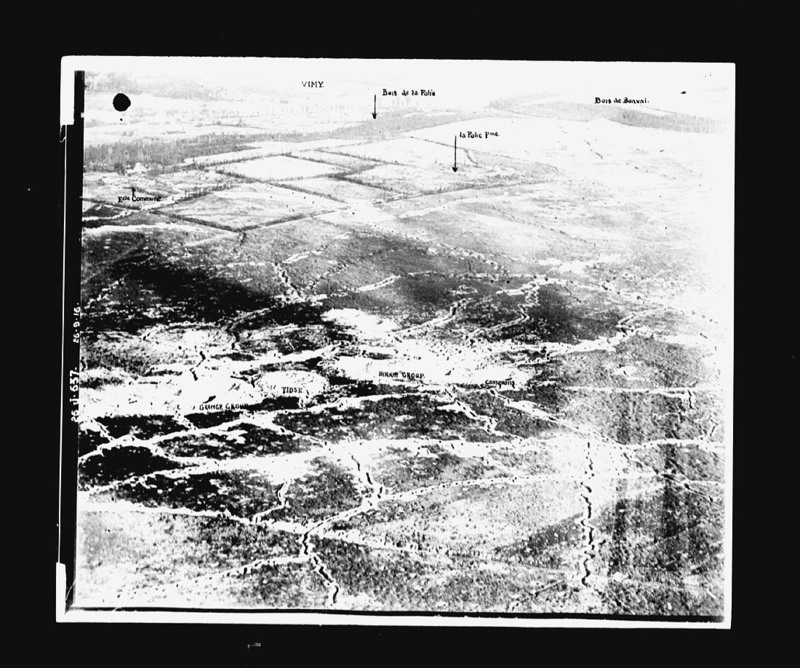 The enemy infantry were observed moving near VIMY and afforded many targets to our guns; troops which were reported as assembling in VIMY for a counter-attack being heavily bombarded with gas shells. (Stormy with snow) All night and in the morning of the 10th the work of consolidation proceeded steadily, and from time to time additional prisoners were taken out of dug-outs and sent back. At 4.00 P.M., during a heavy snowstorm, strong patrols were sent out by Brigade instructions to work in conjunction with patrols from RIGHT and LEFT Battalions in order to definitely locate enemy positions. Lieut’s HEINEKEY and SPINKS, taking charge of the patrol from this Battalion, which reconnoitred PETIT VIMY and the BLOATER trench system. These defenses were heavily manned – severe casualties resulted from rifle and machine gun fire. Lieutenant SPINKS who had already rendered splendid service as Scout and Sniping Officer being killed, and Lieutenant HENEKEY severely wounded; in spite of the heavy enemy fire, both killed and wounded were brought in. Towards dusk the weather improved, and “C” and “B” Coy’s were brought up from the SWISCHEN STELLUNG to relieve “A” and “D” Coy’s and continued the work of front line consolidation. At 11.00 P.M., a deserter and five other prisoners was brought in by the 1st C.M.R., and he confirmed the information obtained by patrols during the afternoon as to the BLOATER and PETIT VIMY defenses. Throughout the night work continued, whilst our artillery kept up an unremitting fire upon different targets reported in front of our position. Stormy weather still prevailing. During the morning enemy movement was very pronounced upon the VIMY PLAIN in front of our position; parties of infantry being scattered and transport disposed of by VICKERS and COLT GUNS. The enemy shelled our forward positions heavily, from 11.00 A.M., to 4.30 P.M.
At 10.30 P.M., the 2nd C.M.R. was relieved in the front line by the 60th Canadian Battalion and in the SWISCHEN STELLUNG (Support) by the 52nd Canadian Battalion. The Battalion attacked with 23 Officers and 664 Other Ranks, and its strength upon relief was 14 officers and 353 Other ranks.During the advance casualties were chiefly sustained from enemy barage upon the CRATER LINE and his immediate front line system, and later on during the process of consolidation. It is impossible to estimate the dead as so many are completely buried, and whole dug-outs have been obliterated by our Artillery fire – but 8 Officers and 183 unwounded prisoners were sent back to the cage. as well as large quantities of stores etc.